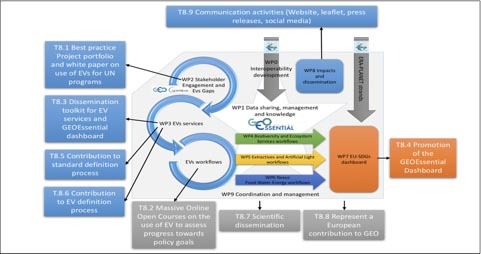 This WP will develop specific actions to capitalize on the project results for societal impacts, to ease the transferability to user communities, to establish feedback loops, to foster the use of open access portals and platforms for dissemination of data and knowledge, and to ensure linkage to the GEO 2015-2025 Work Plan and the ERA-PLANET Dissemination work package. An important aim will be to support policy and relevant stakeholder groups for decision making with close links to relevant GEO tools, services and platforms. Earth observations and geospatial information contribute in novel and practical ways to support achievement of the SDGs. Increase skills and capabilities in uses of Earth observations for SDG activities and their broader benefits. Broaden interest and awareness of Earth observations support to the SDGs and social, environmental, and economic benefits. Task 8.9: Communication activities (AUTH, UNIGE, CREAF). Website of the project, leaflet, press releases and, social media presence.